This old Tonk Brothers guitar just showed up at my shop. It's here to be consigned so some lucky musician is going to be taking this home. First it needs some work. The classical style bridge will be replaced with a shop made replica of it's original steel string bridge. It will get a neck reset, a leveling of the fingerboard and new frets. I've worked on this model before and Im certain it will be a tone monster/sweet player. There is a clue to it's most recent lineage in the photos. I'll do my best to post pictures of the restoration process. Photos 6 through 9. 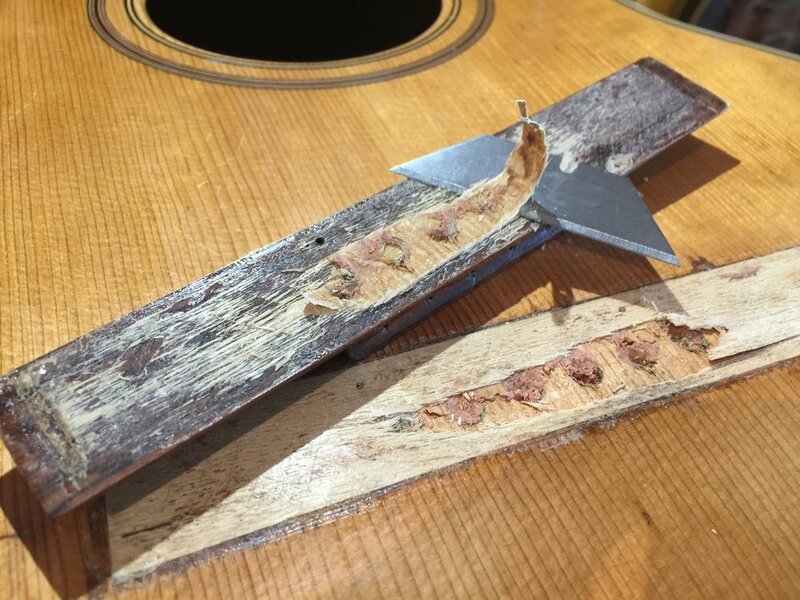 While working on the bridge removal it struck me to illustrate a problem that is so common on old guitars (and even newer ones from the big manufacturers) that I stopped to show you what I'm talking about. In this case the point where the 1st string crosses the saddle should be about 2/32" longer than exactly twice the distance from the nut to the 12th fret. If you look at the pictures closely you can see the 12th fret lies about 12 and 43/64" away from the nut. 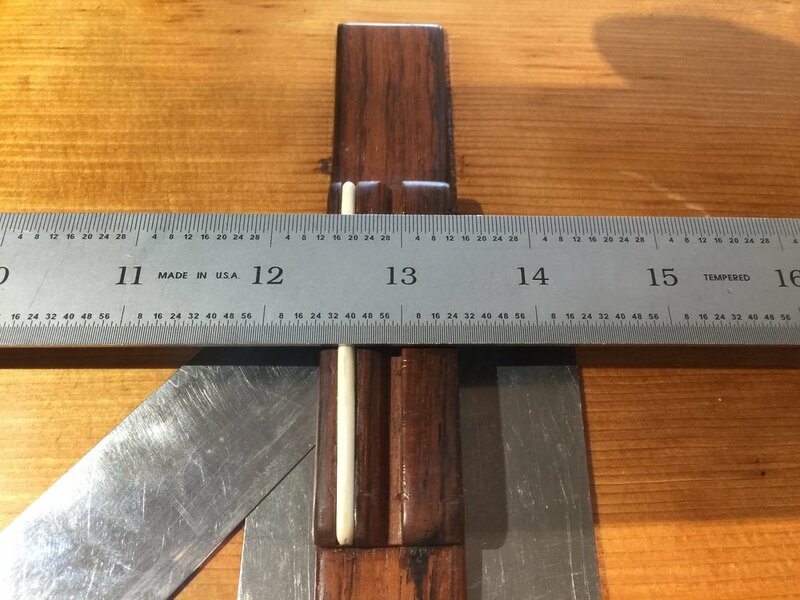 Now look at the measurement from the 12th fret to the saddle. Do you see the trouble? The saddle position under the 1st string should be at 12 47/64" from the 12th fret and it's actually at 12 36/64". In it's current state this guitar is going to intonate poorly and play very sharp. Still there's good news to be found under the bridge. The repair person who put on the incorrect bridge left the original finish intact at the ends. That means I can make a proper 6" wide bridge instead of having to match the 6 1/2" wide incorrect replacement. Where the top patch failed in the middle you can see the original bridge pin holes.